We are back from almost two weeks in Chattanooga, Tennessee and are now getting ready for this week's VINE-YL post. I thought we would blog a bit from our trip but we were way too busy eating. Highlights included Bojangles biscuits every morning and our final day when we had fried chicken for lunch and fried catfish for dinner. It was awesome. 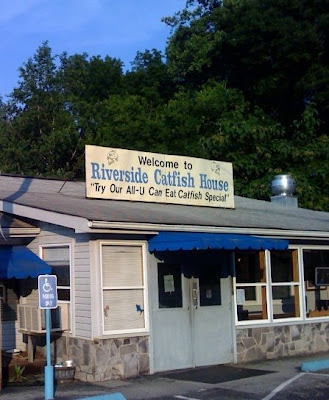 If you are ever in the greater Chattanooga area try and find the Riverside Catfish House. It's a bit of a trek, but it is well worth it. Their specialty is of course fried catfish which is amazing, but they also have some of the best hush puppies this side of my uncle Alvin's house. They also have a pretty amazing view.